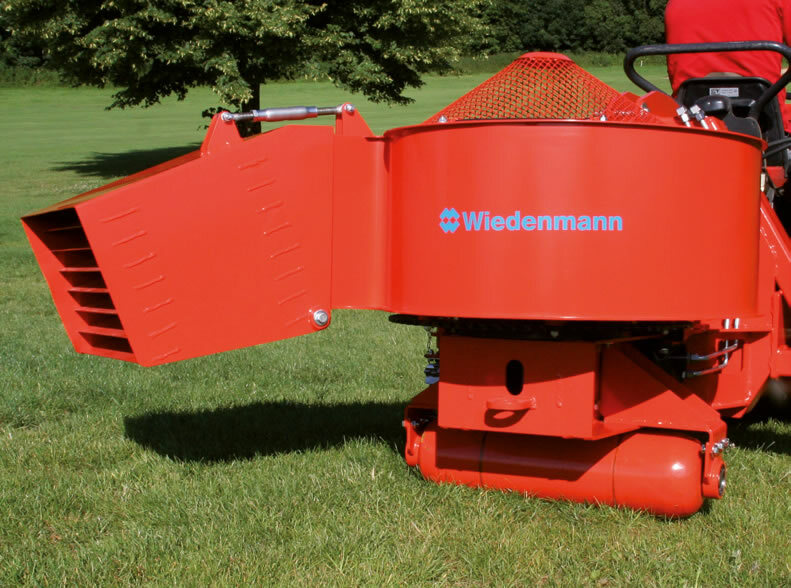 Leaf & debris blowers for sports pitches, parks and estates. Meet our two blowers, the Mega Twister and its smaller sister, the Whisper Twister, both with a patented ‘whisper’ turbine. An innovatively side-routed airflow system operates with spent air discharged through a low level air vent, allowing the ground to absorb almost all of their noise. The Mega Twister has a versatile 230° swivel action, 390 m³ per minute airflow and is easily adjusted in all directions. Leaves and debris can be blown continuously in one direction with no requirement to leave the cab, back up or turn the unit round. The blow out nozzle can be set vertically, so that the air stream can be adjusted to the prevailing conditions guiding leaves and debris accurately and quickly. The Whisper Twister turns 180°and has 200 m³ per minute airflow. Both have large support wheels to ensure they adapt easily to uneven terrain. Optional equipment: Straight or goose neck nozzles are available that can be adjusted hydraulically, manually, or with an electric actuator. If you are interested in our WHISPER TWISTER / MEGA TWISTER use the quick enquiry form below.